Buying a period property such as a Georgian property we believe has many advantages which we will talk about within this article. We also believe that there are some issues that you need to look out for and ways that you can help yourself when buying a Georgian property. 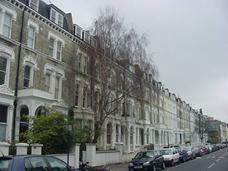 This particular article looks at converted Georgian properties which are properties which were once a large property which has later been converted into several properties. We are Independent Surveyors that deal with all types of property related work and are happy to help you with property problems. As Surveyors we have not only carried out surveys on Georgian properties we have lived in them too which can give a very unique viewpoint for you when buying a Georgian property. We would also like to introduce to you what we call our good, bad and ugly survey which is a building survey which is sometimes known as a structural survey which we have developed over many years, in fact several decades. We have listened to feedback from our clients and amended and altered our surveys to make them easy to read and describe issues clearly. The key factor we believe is our surveys are easy to understand in plain English but do not take our word for it call us on free phone 0800 298 5424 and ask for an example of one of our surveys to be emailed to you. We have normally carried out a building survey similar to the property you are considering buying and therefore we can show you an example of the type of structural survey you will be receiving. We would recommend that you do not just book a survey but with whoever you decide to have your independent building survey with you talk to them, receive an example survey as well as meet with the surveyor at the property. There are various ideas we have developed over the years to make our surveys more readable everything from 16x optical zoom digital photographs next to the problem which show and explain what the problem is to sketches that clarify any issues particular ones that we cannot photograph but know are present. We have commissioned our own sketches to explain property issues which you will not find with any other Surveyor. 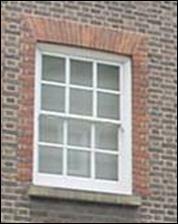 For example this is a Georgian sliding sash window of several types used during the Georgian era used to explain the property that you are looking to buy. Without doubt buying your first property is a major step and also can feel like a never ending process and a very costly one also. We find most people are of course very enthusiastic at the start of their search for property but often once the reality of fitting house hunting in around a job or children is added into the equation it can become a very frustrating process. We would also add that without doubt most clients say that it is more expensive than they expected. One very important issue to establish is that you do need to know who is on your side and that estate agents are selling properties earning commission on the sales and only get paid when they sell a property. Estate agents have no other reason to help you they are in the business of making money from sales of property. You may believe that this is a very hard statement and that estate agents you are dealing with are helpful. You do need to remember at all times that estate agents are acting for the seller of the property and not for you even though many estate agents use sales techniques that make it feel like they are acting for you. As mentioned we are Independent Building Surveyors and are advertising our services but you do need to remember that if you book us or another Independent Surveyor that we are on your side. Executive Summaries within our building surveys make it very clear what the important issues are, our action required i.e. what you have to do to sort out the problems as well as the anticipated costs are what you need to have highlighted when your are negotiating the sale price. Remember although you have made an offer for the property this was assuming that the property was in average condition for its age, type and style if it is not in average condition it is normal practice to negotiate. With an older property such as a Georgian property you are not only are you taking on an older property you are also taking on a converted older property therefore the quality and standards when the building was originally built are very different to today. 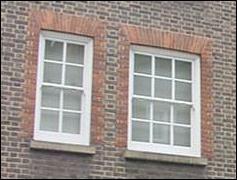 For example today the focus is very much on thermal efficiency in years gone by, particularly in the Georgian era it was very much more the use of natural light which is why Georgian properties have such large windows and they were still waiting for electricity to be invented. You are also taking on the standards of the conversion to the one or two bedroom property which were carried out during boom years such as the 1970s, 1980s and 2000s. Often conversions were carried out to very different standards and of course it does depend upon the builder or developer. Remember when you are looking at a Georgian building you are looking at living in a building that was built many, many years ago when standards were very different with the latest inventions being drainage and electricity or gas dependent upon the age of the property. This article looks at Georgian conversions that you may see and typical items that Surveyors will spot for you although we do have to say that nothing is as good as getting your own structural survey and meeting your own Surveyor at the property. We are of course promoting our services 1stAssociated.co.uk call us for a friendly chat on 0800 298 5424. Georgian properties such as the property in the adjacent photograph have been divided floor by floor into several one or two bedroom properties can make great places to live. We particularly like the space and the ceiling heights however there are many factors to consider. 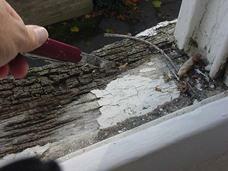 We believe the original dividing of the property was carried out in the 1960s and has since been upgraded. 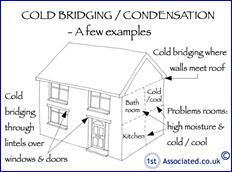 We also believe that original dividing up of properties can be gauged by when property booms take place for example in the early 1970s many larger properties were split into smaller one or two bedroom properties. This also took place in the 2000s as well when property was booming again and people were buying almost anything with many people wishing to be on the property ladder. Equally at such times of rapid property purchasing and boom times in the property industry good quality building tends to be less important than finishing a job quickly. Georgian properties can make great space for one or two bedroom properties as they tend to have higher ceilings than is now the norm and also larger windows making them a very light building. Noise can divide into various different types of noise everything from noisy neighbours to noise transfer that travels through the property. 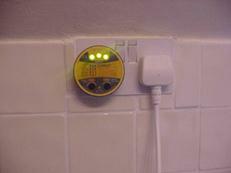 Noise transfer is often the case in older properties as little consideration and thought has been given to this area. When carrying out a building survey on a one or two bedroom property we are always pleased to meet you at the one or two bedroom property as this helps us to explain any problems that we see. Without us wanting to sound too much like Estate Agents, which we certainly are not, as Surveyors we do find that Georgian properties have certain characteristics and features from the period that make them very pleasant properties to live in. 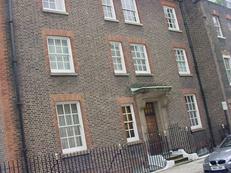 Externally Georgian properties tend to have larger, grander door entrances and large sliding sash windows usually sliding sash windows with a two by six casement panel. Remember that Georgian properties were being built before the electric light bulb had been invented. 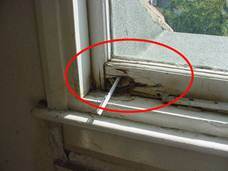 Having said this, sliding sash windows that have not been maintained can be a problem. 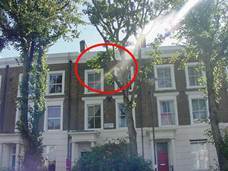 Georgian properties normally faced the best direction giving sunlight but you do need to check the position of the property you are looking at. 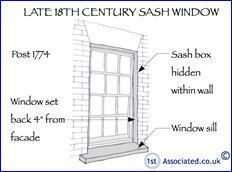 Finally without getting into too much detail with sliding sash windows they do come in all sorts of different styles and types. 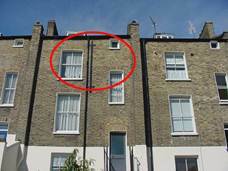 For example if you look closely at the sketch and the photograph they show two different types of sliding sash window – can you spot the difference? 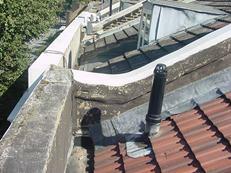 Georgian properties are likely to originally have had a clay tile roof or a slate roof and problems can occur with these roofs over the year's dampness getting in. Georgian design was particularly fond of hiding the roof behind a parapet wall where all sorts of problems can also be hidden. 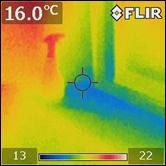 These are common and relatively obvious problems that a building Surveyor should be able to spot. 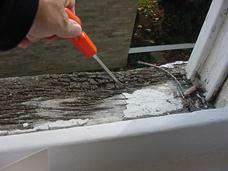 We believe that our surveys go above and beyond normal surveys but not only offering you the recommended action required but also give anticipated costs as well as actually getting onto the roof if we can to view any issues. Walls to Georgian properties come in all sorts of styles and sizes with the brick sizes varying as they still did not have a standard size brick in this era. 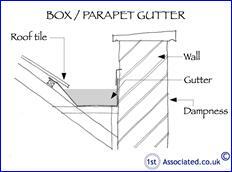 One of the main reasons for brick sizes varying is brick tax. 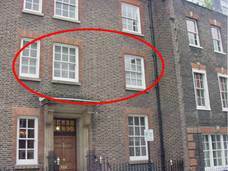 Bricks became popular for building smaller houses in the 18 th century with a brick tax coming into force in 1784, increasing in 1794 and again in 1803. 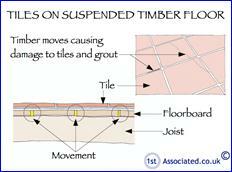 The implement of brick tax slowed down the building of properties using bricks but when the tax was later repealed in 1850 bricks became widely used. 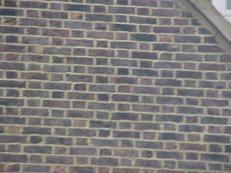 Whilst bricks were taxed an alternative was to use a brick tile sometimes known as a mathematical tile. 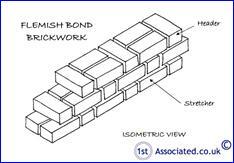 Walls are likely to be Flemish bond construction with a lime mortar or possibly rendered. 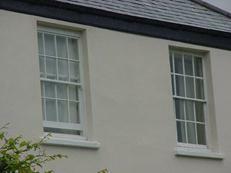 We have mentioned previously the large sliding sash windows that Georgian properties tend to have had originally. 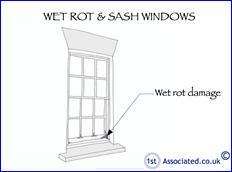 Sliding sash windows need to be looked at very carefully as problems can occur with them. 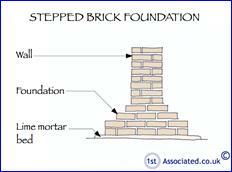 Stepped brick foundations are likely. Watch out for immaculately presented interiors. We use the term painted to sell and often properties can be much more than painting such as plastering over cracks and painting to hide dampness. We have come across furniture strategically positioned to hide defects. 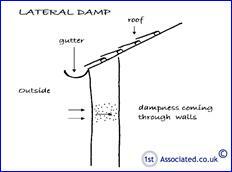 Many older properties do suffer from dampness with the dampness ranging from rising damp (although this is nowhere near as common as damp proof companies would have you believe) to lateral dampness often caused by weathering or pointing or indeed wrongly rendered properties which result in properties not being able to breathe. 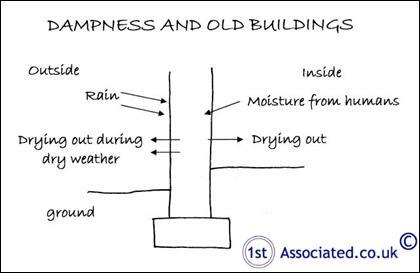 Probably the most common form of dampness we come across is condensation often occurring at the bottom of properties and being wrongly called rising dampness. The problem is the amount of humidity being caused in the property with everything from cooking to bathing and showering to drying clothes. Be very careful if you do not come across a property where dampness has been hidden only for it to reappear as soon as the property has been sold. 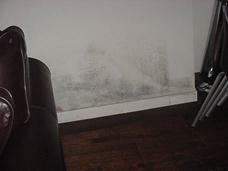 With dampness comes all sorts of issues such as black mould. If you are interested in having a structural survey on a one/two bedroom property please call us on free phone us for a friendly chat on 0800 298 5424. If you are a landlord please contact us as we would be happy to help you with Schedules of Condition or Structural surveys on blocks of flats.